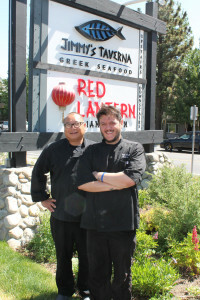 Leonin, Morriss find new homes respectively at the Red Lantern, Bistro at Snowcreek. One chef has tripled his restaurant’s business in the eleven days he’s been open. The other chef hopes to match his success. First, the chef who’s already started. That would be David Morriss, former Executive Chef of Sushi Rei, who just reopened the Bistro at Snowcreek and counts fellow notable local chefs Ian Algeroen and Frederic Pierrel among his fans. “Ian’s been in here about six times already,” says Morriss, 43, who married Jill Saari and has a three-year old son Charlie. The Bistro has tripled its historical numbers since it reopened. What sets the Bistro apart, says Morriss, is the value for the price. Owner Connie Black, he says, “wanst to make guests happy and push revenue. I don’t have to price things here like Levy or the Westin (where he has history as the former Executive Sushi Chef). The Bistro is open seven days a week starting at 4:30 p.m.
Rich Leonin spent more than ten years working side-by-sde with Mike Coco at Thai’d Up, but Leonin gets the opportunity to run his own shop and honor his Chinese heritage by reopening the Red Lantern. Rich Leonin and Brian Kiepler. He and Sierra Nevada Resort Executive Chef Brian Kiepler have spent the past four-to-six weeks putting together a traditional Chinese menu. That’s why we strategically positioned them in front of the Asian fusion description below the sign for the photo – because there is no more fusion. Just look for classic Chinese food, down to the little white take-out boxes, priced accessibly. The Red Lantern has a soft open Friday night before opening to the general public on Saturday. It will be closed on Mondays and Tuesdays.